In this last full week of October, I’m realizing I still have a lot of things I need to finish by the end of the month! I finished the Halloween bag and Mr. Skellington for my niece; it turned out too small for a trick-or-treat bag since I wanted to use the pumpkin fabric that I won from Spotted Stone, but I think my sister-in-law gets her daughter a new trick-or-treat bag every year, so it should be okay. Even though it’s super simple, I had to practice drawing the kitty a lot before I drew it onto the bag — I’m really not a good drawerer! In other news, I wish the leaves here would change color; the tree on the bag is wishful thinking. 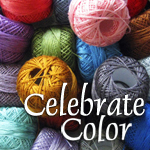 I’m linking to Celebrate Color not because I have any expectation at all of winning, but because linkies are fun. The other entries are gorgeous! What a cute bag! Is it reversible? awww…that doll is to die for…how appropriate.